The US Dollar is digesting recent gains below the 0.91 figure against the Swiss Franc, with negative RSI divergence warning a corrective pullback may be ahead. 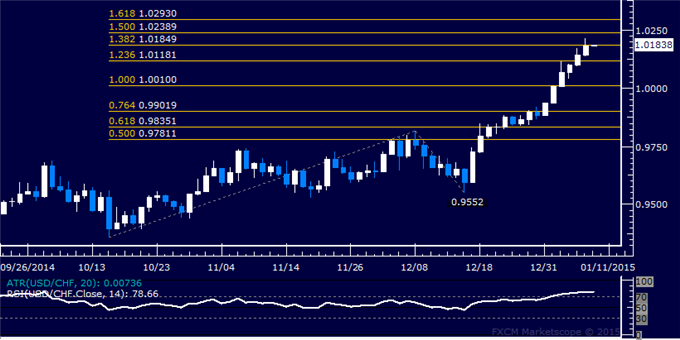 Near-term support is at 0.9054, the 14.6% Fibonacci retracement. A break below that on a daily closing basis exposes the 23.6% level at 0.9017. Alternatively, a reversal above the 76.4% Fib expansion at 0.9110 clears the way for a challenge of the 100% threshold at 0.9189. Risk/reward considerations argue against entering short with prices trading in close proximity to support. On the other hand, the absence of a defined bullish reversal signal suggests taking up the long side is premature. We will remain flat for now. Positioning is inconclusive at this point, with prices sitting in the middle of their recent range without showing clear-cut confirmation of a bearish reversal or a defined invalidation of its possibility. We will continue to stand aside until greater clarity emerges. The US Dollar soared to a 12-month high against the Swiss Franc after turning higher as expectedhaving put in a Bullish Engulfing candlestick pattern. A daily close above the 100% Fibonacci expansion at 0.9429 exposes the 123% level at 0.9526. Alternatively, a reversal back belowthe 76.4% Fib at 0.9272 opens the door for a test of the61.8% expansionat 0.9272. We bought USDCHF at 0.9068 and have since taken profit on half of our exposure. The rest remains open to capture any further upside momentum with a stop-loss at 0.9114, our initial objective. The US Dollar continues to push aggressively higher against the Swiss Franc, with prices soaring to the highest level since mid-July 2013. A daily close above the 38.2%Fibonacci expansionat 0.9564 exposes the 50% level at 0.9646. Alternatively, a reversal back below the 23.6% Fib at 0.9463 opens the door for a challenge of the 0.9401-03 area marked by the September 19 close and the 14.6% expansion. The US Dollar declined against the Swiss Franc as expected after prices put in a bearish Dark Cloud Cover candlestick pattern. A daily close below 0.9541-64 area marked by a rising trend line and a falling channel bottom exposes the October 29 low at 0.9441. Alternatively, a reversal above the channel top at 0.9658 clears the way for a test of the November 7 high at 0.9741. 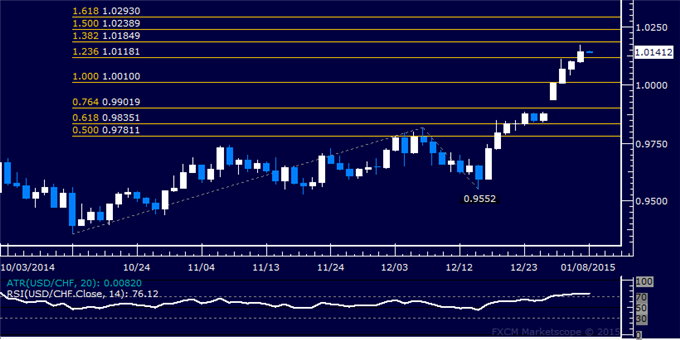 We entered long USDCHF at 0.9452 and subsequently booked profit on half of the position. The remainder of the trade is open to capture any further upside momentum with a stop-loss trailed to breakeven (0.9452). The US Dollar turned lower against the Swiss Franc as expected having found resistance near the 0.9800 figure. 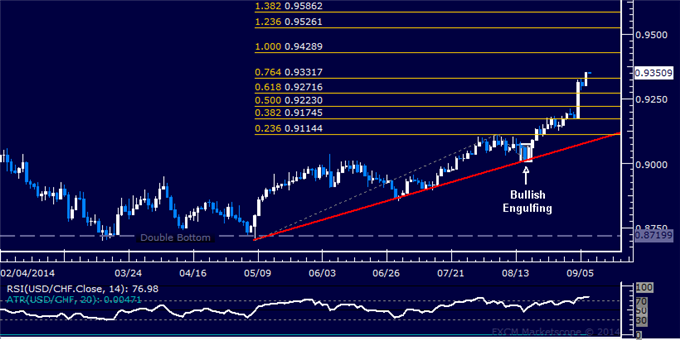 Near-term support is at 0.9554, the 23.6% Fibonacci retracement, with a break below that on a daily closing basis exposing the 38.2% level at 0.9391. Alternatively, a turn above the 14.6% Fib at 0.9654 opens the door for a challenge of wedge floor support-turned-resistance at 0.9723. Our long-term outlook calls for a broadly stronger US Dollar against its key counterparts. 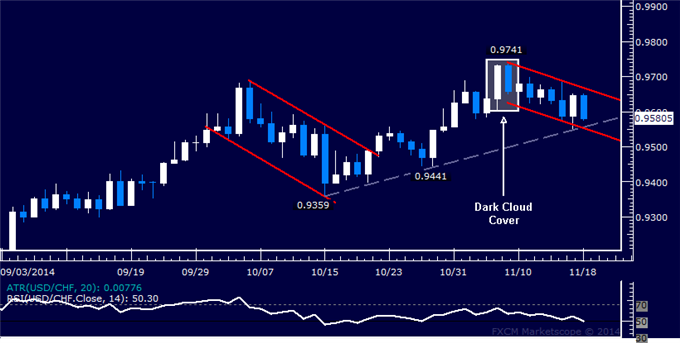 With that in mind, we will treat the ongoing USDCHF pullback as a chance to get long at more attractive levels once a clear-cut opportunity presents itself rather than a short trade setup. The US Dollar mounted a swift recovery against the Swiss Franc after falling as expected, with prices threatening to overturn the downward reversal. A daily close above the intersection of Wedge floor support-turned-resistance and the 38.2% Fibonacci expansion at 0.9727 exposes the 50% level at 0.9781. Alternatively, a decline below the 23.6% Fib at 0.9660 clears the way for a test of the 14.6% level at 0.9619. The US Dollar continues to push higher against the Swiss Franc, with buyers extending the advance for a fifth consecutive day. Near-term resistance is at 1.0185, the 138.2% Fibonacci expansion, with a break above that on a daily closing basis exposing the 150% level at 1.0239. Alternatively, a reversal below the 123.6% Fib at 1.0118 clears the way for a challenge of the 100% expansion at 1.0010. The available trading range is too narrow to justify a trade on the long or short side from a risk/reward perspective. With that in mind, we will remain on the sidelines for now and wait for a more actionable opportunity to present itself. The US Dollar extended its advance for a sixth consecutive day, making for the longest string of gains against the Swiss Franc since May 2009. A daily close above the 138.2% Fibonacci expansion at 1.0185 exposes the 150% level at 1.0239. Alternatively, a turn below the 123.6% Fib at 1.0118 clears the way for a challenge of the 100% expansion at 1.0010. The US Dollar may be set to push above the parity threshold against the Swiss Franc after prices narrowly breached resistance above the 0.99 figure. A daily close above the 61.8% Fibonacci expansion at 1.0132 exposes the 76.4% level at 1.0313. Alternatively, a turn back below the 50% Fib at 0.9887 opens the door for a test of the 38.2% expansion at 0.9841. Entering long is tempting from a purely technical perspective but we will tactically opt to stand aside. Prices continue to build the longest string of consecutive daily gains in 12 years, warning that positioning may be increasingly stretched. With that in mind, chasing the pair higher seems unattractive at this point.